The workshop is organized by the Special Interest Group on Theoretical Computer Science (SIGTCS) of the Korean Institute of Information Scientists and Engineers (KIISE) and the Special Interest Group on Algorithms (SIGAL) of the Information Processing Society of Japan. You can click the map to see a larger one. 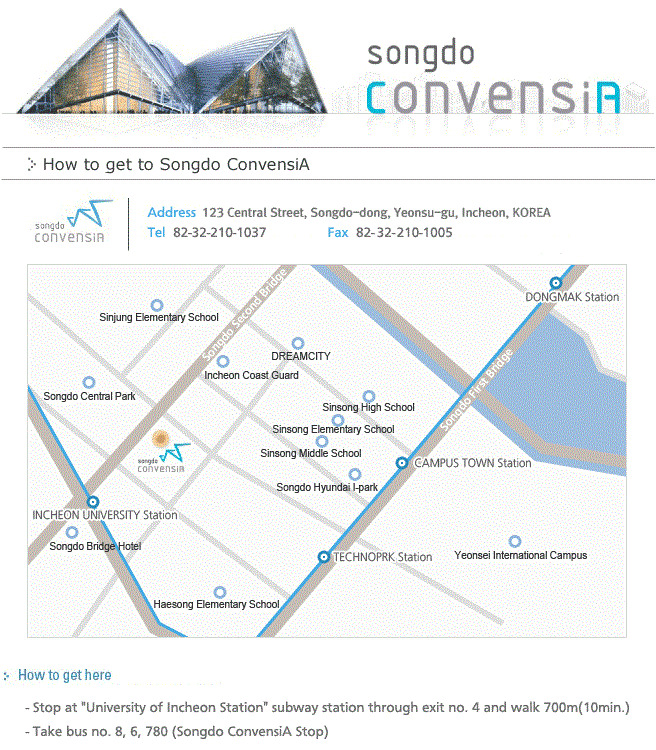 There are many bus or train connections to Songdo Convensia from Incheon Airport. > A recommended route from Incheon Airports is by bus(40mins). WAAC 2015 takes place in Songdo area, a modern district in Incheon. The following is a list of hotels in this area, which are sorted according to the distance to the venue. These hotels can be easily reserved through travel sites such as www.hotels.com and www.expedia.com at a reasonable rate. HyungSeok Kim, Professor, Ph. D.